Join our park staff for a bicycle ride on the riverfront trails in the city. 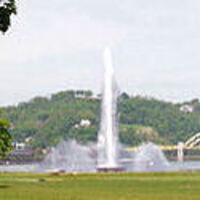 During the ride, we will stop and talk about some of the history of Pittsburgh while enjoying the fall colors. We will bike a minimum of 6 miles out and back. Please remember to dress for the weather and bring plenty of water and snacks. This program is BYOB: Bring Your Own Bike. To participate, you MUST have your own bicyle AND bicycle helmet. You will be required to wear a bicycle helmet for the entire program. Ages 12 and up. Anyone under the age of 18 must be accompanied by a participating adult. Space is limited, so registration is required. Please register by clicking the green "register" button to the right. Meeting location will be emailed after you register. If you have any questions, please email our education staff at RA-pointenved@pa.gov.